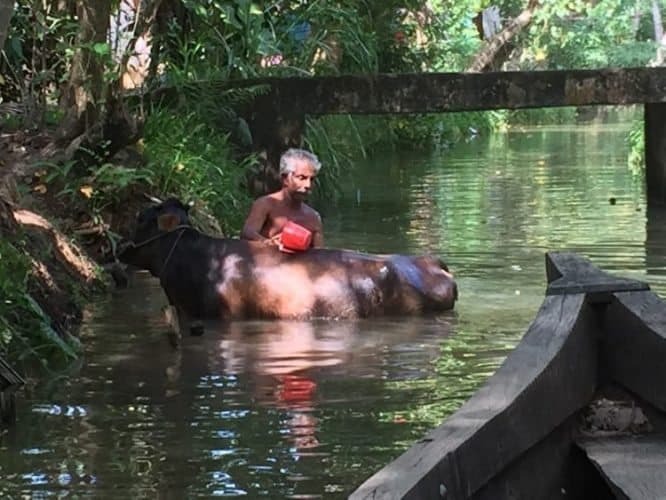 Bathing a buffalo in Monroe Island near Kerala, India. 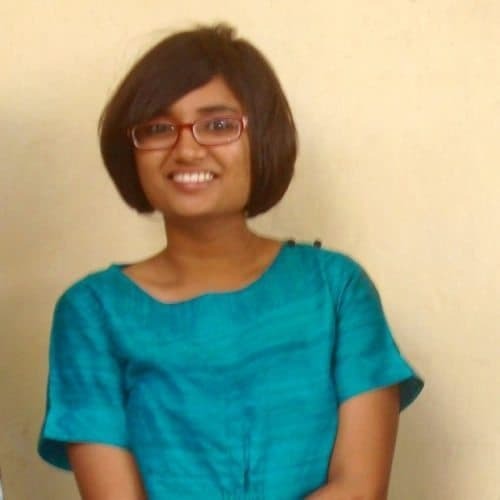 Nripsuta Saxena photos. India Trip: An Indian-built Ambassador car on Monroe Island, Kerala India. 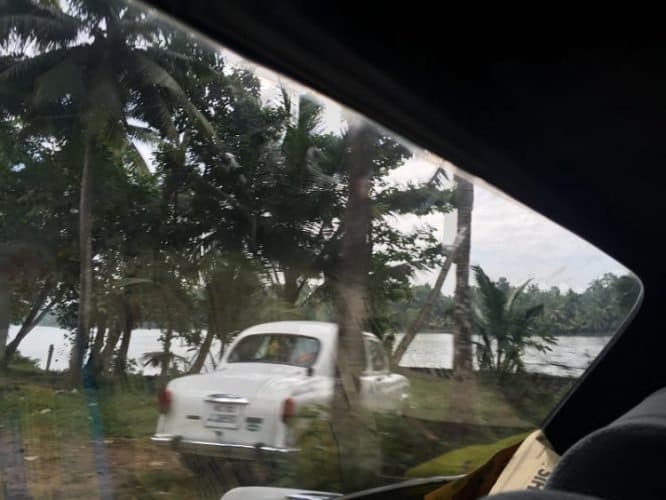 India Trip: An Indian-built Ambassador car on Monroe Island, Kerala India.It had been ages since I had had a holiday and so when my parents agreed to one, I was delighted. 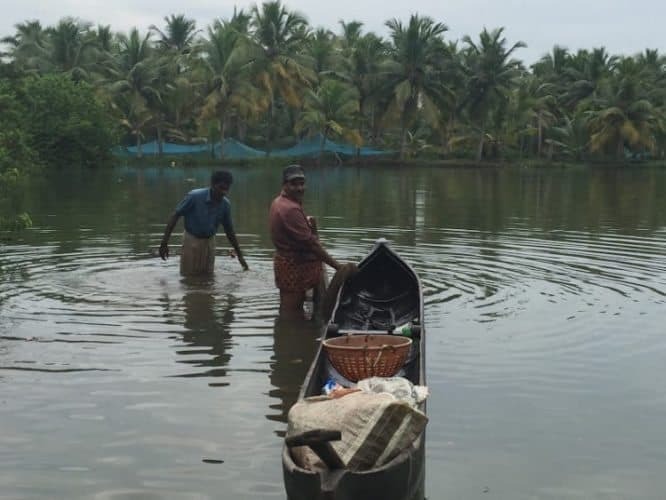 After surfing the net for a while, attracted by the prospect of seeing the backwaters, I chose Kerala in India to get to and comfortably delegated the headache of chalking out an itinerary to my dad. We boarded a very early morning flight from Delhi, wearing sweaters and on landing the first thing that hit me was the heat of Kochi. Oh boy! Was it hot! But the laidback city had much to explore, with some amazing finger-licking good food to boot and after a comfortable train journey, as I went to bed at night, I was in a happy frame of mind. 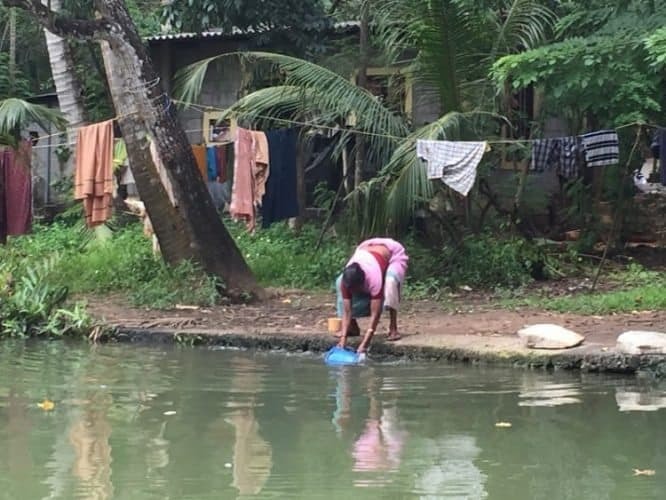 Collecting water from the canal. But I felt like I had barely had the time to close my eyes when I was being woken up. Just when a lovely breakfast of hot crisp dosas, a fermented crepe made from rice batter and black lentils, and the best filter coffee I have ever had was reviving my spirits, my dad managed to spoil things again by nagging me to hurry up for the trip. The three of us were bundled into an old rickety clunky Ambassador, which were once built by Hindustan Motors of India, and are no longer under production. Good Lord! Who on earth travels in an Amby these days? The car shook me all up like a sack of potatoes. 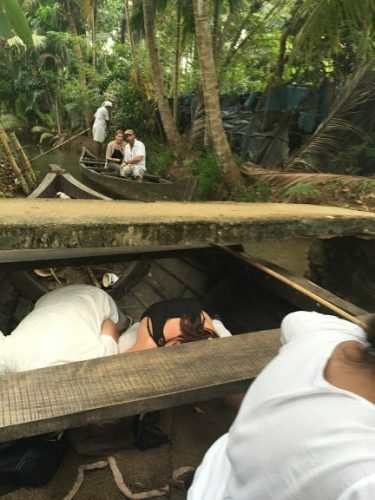 When the torture mercifully was over, I found myself standing in a narrow nondescript gully with a local boatman guiding us into his long, rusty, narrow wooden boat. My spirits sank. I cursed myself for agreeing to come on this trip. I had been forced awake in what felt like the middle of the night and leave behind half of my heavenly coffee for this? For the first time in my life, I agreed with my mom who said that my dad could do nothing right. I googled ‘gully’ (yes, cellular internet speeds were faster in the middle of this god-forsaken place than in the heart of Delhi! ), and I found nallah (drain) as one of the meanings in Hindi. So I was about to spend the next hour or so on a boat in a nallah! And that too there was just the lone boatman. To make matters worse, he didn’t appear to have any oars. So how long would this torture take? I didn't know whether to laugh or to cry. After all, I had only myself to blame. Never again in my life will I agree to a trip without first researching it properly, I promised myself. My spirits lifted when I got a message from a friend and I got engrossed chatting on WhatsApp. Suddenly I felt a cool breeze. I looked up and realized that we were cruising along at a pretty fast pace. The boatman was skilled and was adept at maneuvering the boat with just his one long pole. And then it hit me. I was transfixed by the sight all around me. The gully had widened out so much that for quite some distance all I could see was the clear, tranquil, blue water with swaying trees. 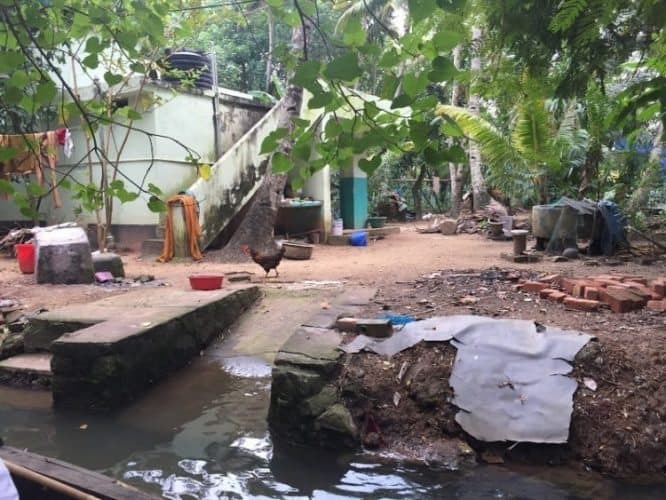 Among the graceful, tall palm, coconut and banana trees were pretty thatched roof cottages. Quite a few other boats sailed past. Everyone appeared to be enjoying the calm, peaceful beauty of nature. All I could hear was the rustling of leaves, the quacking of ducks, the chirping of the birds and the gentle lapping of the waves of water. The sunlight was so soft and gentle that it gave everything a golden glow. It was surreal and with sheer bliss, I immersed myself in photographing it all. What my photographs highlighted was the lushness of my surroundings. Anywhere that I looked was rich, dense, green foliage. It was a feast for the eyes. I didn’t know much about plants (botany had always bored me in school) and when the boatman heard me, he would stop at intervals and point out the flora and fauna. I discovered his name was Mr. Sudershan, and he showed me the vanilla plant. I hadn't even known that vanilla grew in India! Then there were mangrove plants, peri peri pepper plants, the pretty chilli plants with the very tiny but extremely hot red chilies in it. (These had refused to grow in our house when my mom had got the seeds from a friend.) I had seen loads of photographs of my favorite pineapple trees but seeing a red pineapple flower was something which made my day and the best part was that the flower was at ground level, so if the boat was close enough, you could even touch it! .The sights before us were varied and absolutely beautiful - cut coconuts being dried in the sun before they were crushed for oil; ducks running around; kingfisher and trogons on the trees; buffaloes bathing in the canal, local men and women making coconut ropes and mats on the banks of the canal; small workshops being conducted on how to make boats - the journey was just like being in an alien world, far far away from the hustle and bustle of cities. 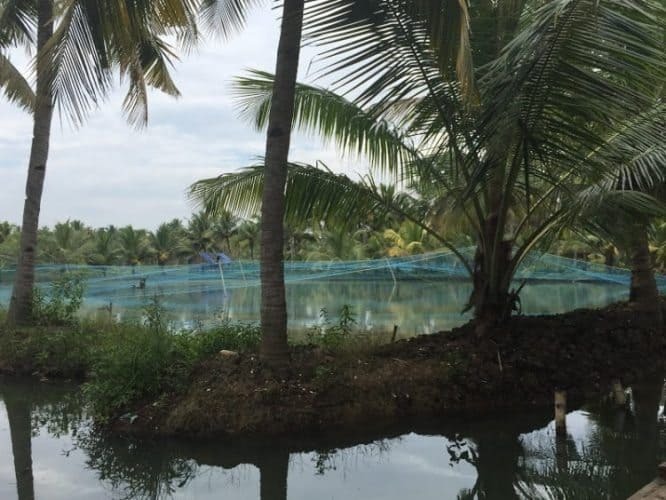 Small ponds near the banks of the canal covered with nets attracted my attention and I was told by Mr. Sudershan that these were prawn farms and the nets were placed to keep the birds away. Only man had the right to kill; did someone talk about feeding and saving the birds? The boat halted for a break. With a shock I realized that our hour-long journey had flashed by. Einstein's Theory of Relativity came to mind, as it did whenever time flew by when I was enjoying myself. It was a dreamy journey, and it made me realize that India really does have an amazing variety of scenery! I have always been fond of coconut water and was often scolded for spending too much money on it. But this was different- - the plentiful coconuts here seemed to provide an endless supply of water. Oh! it was organic, fresh, and simply out of the world. The lady artistically cut the skin of the coconut and fashioned a spoon out of it, so that we could eat the tender kernel after finishing the coconut water. I would come back to this place for the coconut itself. The canals were man (or woman?) made, and so small bridges had to be made after certain distances to enable crossing the canal. These bridges generally consisted of just a few large stones or some concrete slabs. 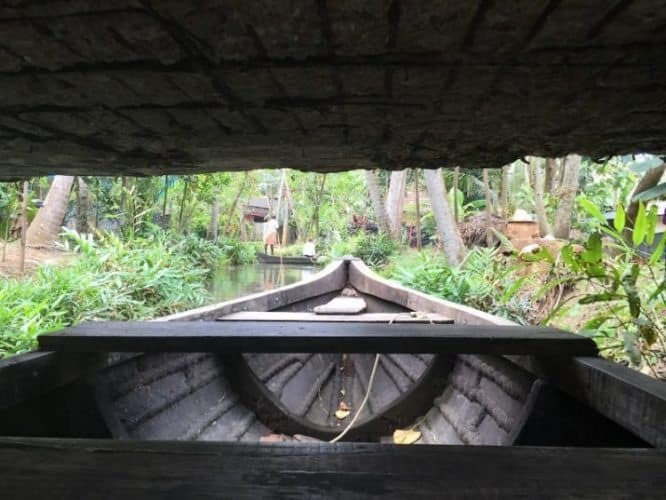 When in the boat, the bridges would be around your head level, and so every time our boat passed under a bridge, we had to bend downwards to pass underneath it. “Bend properly or you won’t have your top story left,” joked my father, but for the first time, it really was a possibility! The most interesting part of the ride was when the bridge was at the level of the boat! We had to literally lie down horizontally on the floor of the boat! I was thrilled when I got up. On crossing the bridge I saw another boat with a girl crouched like me but the guy was busy taking photographs. The photographs would be out of the world but he had come almost to the bridge and I apprehensively waited, expecting the worst. But to my surprise, he jumped on the bridge and waited for the boat to pass under it. As soon as it did, he hopped back on! I wish I had done that. So much cooler than lying down on the boat like everybody else! The best was yet to come. There were two trees on either side of the canal, and as a result of which it narrowed immensely. I was certain that our boat could not pass through it. Our expert boatman, though, looked unperturbed. The boat entered between the trees, hit the tree on the right side, changed direction because of the impact, and then hit the tree on the other side and once again changed direction due to the impact. 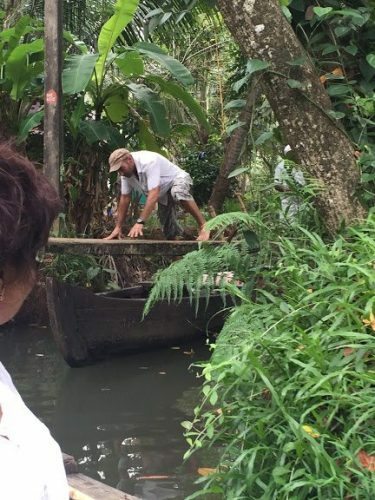 Now, the widest part of the boat was stuck between the trees. A local's house on the canal.My judgment was correct after all, I thought proudly but suddenly realized that how would we get out?! I wouldn’t let my father, with one arm in a sling, nursing a fractured arm, push the boat even if he volunteered. So it was left to me and our European companions. Mr. Sudershan asked me to get up. I was proud to be selected as the man of the boat and could have pushed it out myself. The thrill would be more than the irritation of sitting with wet jeans, as we were about to disembark the boat. Mr. Sudershan stopped me and asked me to sit on the edge of the boat. I obeyed, puzzled and what I saw took me by surprise. Because of my weight, the boat dipped a few inches on that side and the opposite side rose a few inches, and now that the boat was somewhat diagonal, just a push of the pole sufficed, and the boat passed between the trees as the horizontal width decreased by about six inches. Some application of Newtonian physics, though I bet this guy hadn’t even heard of him! As we neared the end of the journey, I reflected that this truly deserves to be called God’s own country, as Kerala advertises itself. I was unwillingly pushed into the boat at the beginning of this journey and was now unwillingly dragged out at the end. Even the Amby, there to take us back to the hotel, didn't bother me anymore. With a coconut in my hand, as I crossed the bridge to leave the island, I waved, saying “See you again soon. Love you Munroe Island! Location: Munroe Island is located at the confluence of Ashtamudi Lake and the Kallada River, in Kollam district, Kerala. One of the many prawn farms, with nets to keep birds away. How to Get there: By air: Kollam (formerly Quilon) is 66 km from Thiruvananthapuram airport and 168 km from Kochi airport. Kollam is also well connected by rail. Munroe Island is 26 km from Kollam. Best time to visit is between October and March. A tourist visa is available for US citizens. You can upload the required documents (your photograph and passport page) along with an online application form on, pay your visa fees via debit or credit card, and receive an “electronic travel authorization” via email. Local men going to work on the canal. Kerala’s state tourism website is a trusted website which may be used to book tickets, hotels, and houseboats. Find all of what you need at Travmed.com, a GoNOMAD partner. Do not drink tap water and avoid street food. Dress conservatively, avoid traveling alone, especially at night, on public transportation or in remote or unlit areas; and do not give out your hotel room number. Beware of beggars and touts. More information can be found at the US Dept of State's website. Having said that, India is a land of myriad contrasts in terms of geographical terrain, languages, cultures, food habits, climate and more. The traditional golden triangle consists of Delhi (Red Fort, Humayun’s tomb, Dilli Haat), Agra (Taj Mahal, Fatehpur Sikhri) and Jaipur (Hawa Mahal, Amber Fort). You can also visit the cold desert in Ladakh, see the sand dunes in Jaisalmer, enjoy the beaches of Goa or enjoy the beauty of the backwaters of Kerala. There is a lot to explore. Plan well beforehand.